Soupe de Pistou is a warm summer soup typical of the Midi and Provence areas of France. You may wonder, especially if you are familiar with the weather in those areas, why a warm soup would be eaten in the summer? Well basically because its main ingredients are fresh beans and basil, and other seasonal summer vegetables. And it is so delicious that we French don’t mind sweating a little (it actually cools the body down). All joking aside, it is a great soup to eat towards the end of the summer, in this beautiful Indian Summer season, when night temperatures start to cool down. 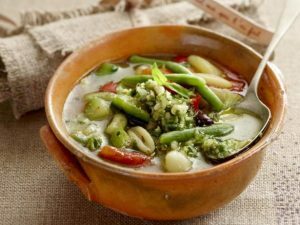 It is a complete healthy meal in itself so perfect for the Indian Summer – fresh but also hearty. And it can be eaten in the Autumn and Winter as well – just freeze some of the pistou you make in the summer and get it out when you want a little flashback of summer flavours! Pistou sounds a lot like pesto and actually that’s because Soupe de Pistou is a soup of Italian influence similar to Italian minestrone made with a type of “pesto”. Unlike pesto however, the pistou paste that is added to the soup is usually made only with basil, garlic and olive oil – sometimes also with fresh tomates. So for the purists, no pine nuts or parmesan cheese is added like it would be for pesto. You might also see this recipe made with pork belly or pasta but I’m making the purist vegetarian version (though I do love a sprinkle of parmesan on top). I think the vegetables, garlic and basil speak for themselves, and with the beans and potatoes there is really no need to add pasta. 600 g of fresh borlotti beans (also known as Cranberry beans or Haricot Coco in French) or other white beans like cannellini. If you can’t get them fresh you may use the dried equivalent, soaked 24 hours prior with the water changed at least once. 3-4 tablespoons extra virgin olive oil, as needed and the best you can get! Remove the borlotti beans from their pods or if dried, drain the beans and rinse. Set aside. Peel and finely chop the leeks. Chop the potatoes, carrots, celery and courgettes. Take the ends off the green beans. Add the other vegetables and the borlotti beans but not the green beens. Cover with water, add the bay leaves, season and simmer over low/medium heat for 45 minutes to an hour until the borlotti beans have cooked through but not falling apart. Taste and adjust the seasonings or add more water about 30 minutes in. Add the green beans into the soup and cook an additional 5-10 minutes until green beans are cooked but still slightly crunchy. At this stage make the pistou paste – it is not a good idea to make this too far in advance before serving since the basil leaves can oxidise and lose some of its flavour. To make the pistou paste it is best to use a mortar and pestle but if you don’t have one, a good blender will also work (just not as well). Pound the garlic with a pinch of salt in a mortar and pestle, or crush it into the mortar with a garlic crusher, then pound it with the pestle until smooth. Remove it and set aside. Grind the basil to a paste in the mortar, a handful at a time, then add the garlic back in and mix together well until you get a homogenous paste. If you are using the tomatoes in the pistou, make a light cross incision on top of the tomatoes and blanche them in the soup for about 30-40 seconds. Take them out and peel off the skin. Then add the tomatoes one at a time to the garlic and basil paste until all ingredients form a paste. If the pistou becomes too watery with the addition of tomatoes, add the remaining tomatoes, chopped, into the soup. Work in the olive oil a tablespoon at a time until the pistou becomes a smooth paste. Add pepper, taste and adjust salt. Serve the soup, adding a spoonful of pistou to each bowl for guests to stir in. Never add the pistou paste while the soup is still cooking because basil is a fragile herb which loses it aromatics with cooking. You can either mix it in after the soup has been taken off the fire, just before serving, or add it to the individual serving bowls. February is…preparing for allergy season!